Thanks so much for all your lovely comments on my last post. I’m so pleased to be a part of the ‘precious things’ collaboration that Sarah devised. It’s been a busy week. I’ve been struggling to fight off a cold which seems to have burnt itself out without too much paracetamol or sniffing. So, BigR’s first full week at school was tiring for me as well as her! Trying to remember what day library books get taken in, to tick off her dinner choice in the morning and also to get to grips with phonics. How anyone learns to read is beyond me. It’s really hard! It’s here I could go all education research-y and talk about unconscious incompetence but I won’t! Safe to say I think I’m more traumatised by the whole thing than BigR who is just keen to talk about obscure rhyming words (no more show and go, it’s flair and éclair!!). We’ve also had the first head lice letter through the magic portal. The ABO and I are now constantly itchy even with the lack of lice...for now. Any tips on dealing with it for an under 2 year old? Even the combs have age restrictions on them!!! 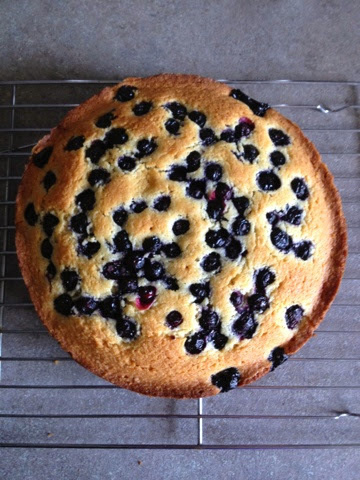 I picked some blueberries off the bush in the garden and made a cake. It’s my fail safe recipe from here. The blueberries were really delicious. 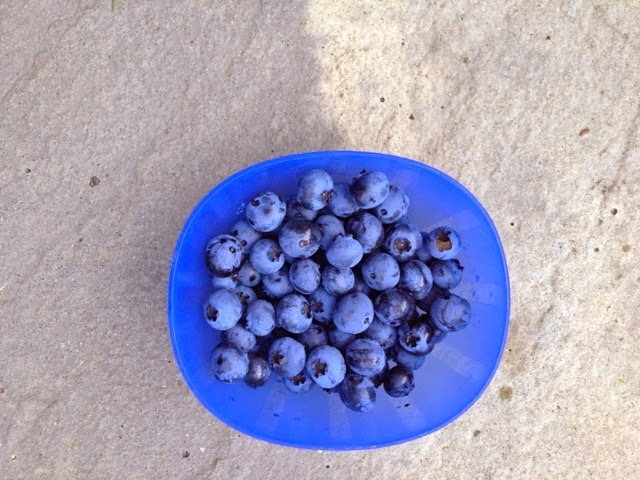 Very sweet and certainly benefitting from a few extra weeks to ripen after first turning that deep blue-purple. The cake was good too and gone in a flash. Last Sunday the girls and I went to Harlow Carr to collect fallen leaves and have a walk. It was mild when we left home, although I took jumpers and coats for the girls, I forgot mine. It was cool in the shade and I was really pleased from a brisk walk when we were in the cover of trees. 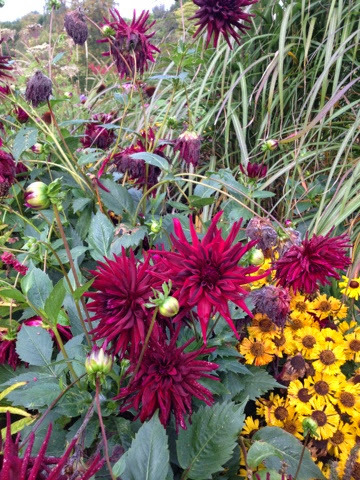 It was so good to see their Autumnal planting, there was so much colour and so many flowers. 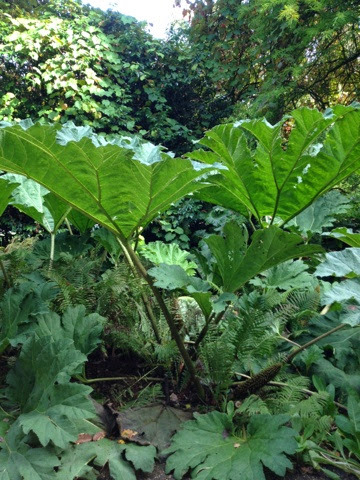 BigR loved hiding under the ‘umbrellas’ as she calls them – to me they seem to be leftover from prehistoric times. 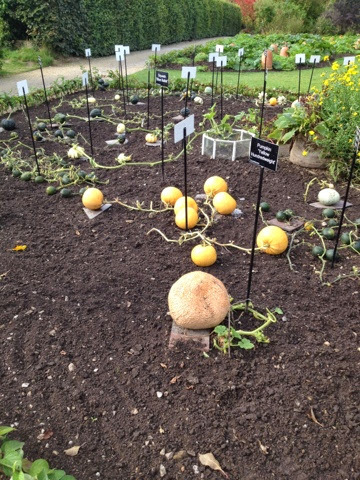 We love to see the kitchen garden and there was a vast field of pumpkins and different gourds. I loved the dahlias. 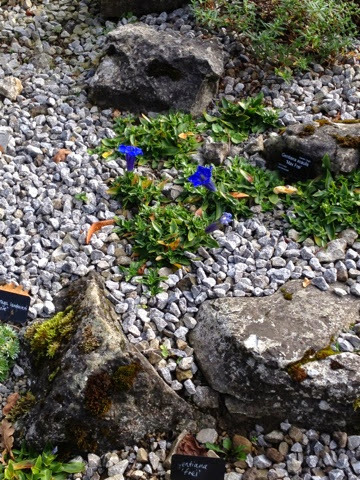 BigR loved the gentian (Elsa flowers!). LittleR loved it all. I love how light and fresh it feels, what a difference having colour on the walls makes. It really highlights the picture we bought in Cornwall (not shown in the photo, the picture at the top of the stairs is by an unknown (to us - there's no name!) Leeds artist). It's given it a new lease of life. After school this afternoon we went to get some photos of the girls printed to go along the stairs, we’ve had them portrait this time rather than landscape, and again, it looks really different. The stairs look beautiful, so fresh and clean. I love the look of your cake and am not at all surprised that it went quickly! Yum. I wish I had lice tips (lice advice?) but that is one fiasco we have not yet encountered. I seem to remember that there were special instructions for babies but I don't know for sure. I hope it doesn't come to that. Have a good week. 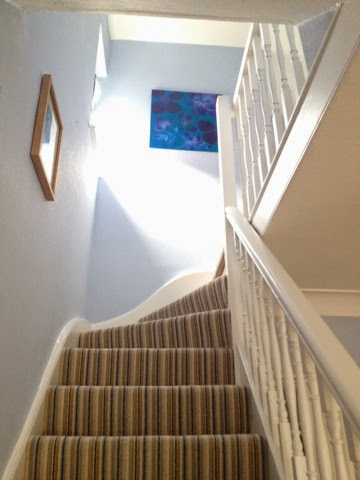 Your staircase looks gorgeous, very light and fresh. It's amazing how a newly decorated room can lift you.